Sgt. 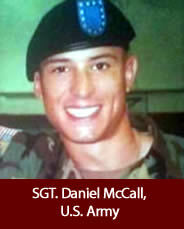 Daniel McCall, U.S. Army, age 24, of Pace, Fla., died Oct. 30, 2007, in Baghdad of wounds sustained when enemy forces engaged his unit with small-arms fire and an improvised explosive device. He was assigned to the 1st Battalion, 15th Infantry Regiment, 3rd Brigade Combat Team, 3rd Infantry Division, Fort Benning, Ga.